Boss Manuel Pellegrini said: "Maybe it's not as bad as we thought at the beginning but he needs at least 10 days or two weeks to recover." The Ivorian will miss Wednesday's match against Sunderland and potential games against West Brom and Crystal Palace. But captain Vincent Kompany is fit to face the Black Cats. Pellegrini also said that striker Sergio Aguero, who came on as a substitute in the 3-2 loss at Anfield, would be fit to make the squad on Wednesday. Centre-back Kompany was a pre-match injury doubt for that game, the result of which left City seven points behind Premier League leaders Liverpool with two games in hand. The Chilean boss added: "Vincent is fit. He is on the squad list for tomorrow and so is Sergio. We'll see tomorrow which 11 will starts." 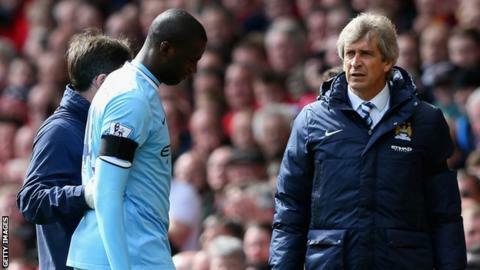 Toure, who has scored 22 goals this season, pulled up with what appeared to be a groin problem on Sunday and was replaced after 19 minutes by Javi Garcia. City must still travel to Everton on 3 May, while Liverpool have to host second-placed Chelsea on 27 April. "We will fight for the title," Pellegrini said. "The important thing is that we win our games. We can do nothing about the other teams."